Ayurveda is a science that comes through lineages, from parents to children, this science goes back to 5,000 years of use. and it is knowledge that has passed all the tests of time. It is not simply a science of the care of our health, but a complete approach to the art of living, which helps us to become aware and to balance our body and mind. It offers an enriching and comprehensive conception of life and health that takes place in all areas of human existence, from the most abstract and transcendental to the most concrete expression. This ancestral art approaches the disease from an integral perspective, not seeking the eradication of a symptom, but the balance of all systems. The purpose of each practice is to help the individual achieve longevity, rejuvenation and self-realization; Ayurveda is the foundation, leaving the way ready to enter the spirit through the practice of Yoga and Tantra. 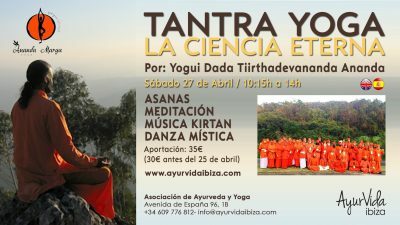 Yoga is the science of union with the divine, Tantra is the most direct method to control the energy that creates the union with the whole; and Ayurveda is the science of life. Ayurveda is not just a medicine, but an art of living in balance between oneself and one’s environment. The tools that this science has to balance us are the substances that nature offers us, herbs, oils, foods; collected and elaborated in a careful, traditional and conscious way. Massages are a key part in Ayurvedic treatments, because massage is the way in which the active principles of these natural substances penetrate properly into the tissues or dhatus, and allow the nutrition and transport of physical or mental toxins, ama, towards channels that facilitate their later elimination. AyurVida Ibiza offers training and treatments, endorsed by Aasramam (Ayurvedic Training Hospital & Collage in Vazhvara, Kerala). In addition always under the supervision of different doctors, such as our great friend Dr. Shiyas Hussain Sheriff, a doctor with traditional Kerala lineage and who will soon settle with us, the Tibetan doctor Sangye Dolma, and Dr. Ven. Lama Jampa, who will consult regularly in Ibiza.